Can you handle England's highest waterfall? Looking for a true canyoning experience? Canyoning is the ‘big brother’ of gorge walking and ghyll scrambling – but with a twist: it requires the use of ropes and more advanced techniques to descend waterfalls. At How Stean Gorge we can offer the exciting opportunity to achieve a vertical descent down England’s highest cascading waterfall at 650ft (nearly 200m). – Cautley Spout. If you’re up for a challenge then this is the one for you. Thrill-seeking is an understatement when you’re climbing to the top of the huge waterfall, surrounded by majestic views of the Yorkshire Dales, ready to abseil down its 11 waterfalls with water gushing overhead. Don’t forget your towel! Cautley Spout is in the Howgill Fells in Cumbria on the western edge of the Yorkshire Dales National Park. We’ll be meeting there in the morning – not at How Stean Gorge. We’ll provide the wetsuit equipment for you. Your guide will teach you the various rope work techniques and technical skills required to descend safely. The terrain is pretty tough, and you’ll encounter multiple small and large abseils, jumps and drops, technical climbing/down climbing and slides. This activity day will involve a walk of up to 60 minutes to access the venue, followed by 4+ hours to descend the canyon. See below for our itinerary for canyoning in Yorkshire, as well as what to wear and FAQs. Please call our office to book on 01423 755666. After meeting in a nearby car park we’ll put on the very best canyon wet suits and equipment. We will walk to the top where we will then brief you with what to expect and demonstrate how to use the equipment safely and efficiently. Then we’ll begin our descent of this amazing series of waterfalls. Due to the nature of this terrain you will encounter multiple small and large abseils, jumps and drops, technical climbing/down climbing and slides. Your friendly guide will teach you the various rope work techniques and technical skills required to descend safely. We will contact you prior to our arranged date to discuss equipment sizing and logistics. The majority of our venues are in the How Gills, Yorkshire and Lake District, Cumbria. Collection in our bus can be arranged if necessary. As this activity does not take place onsite at How Stean Gorge we will NOT be meeting here first, unless you are staying in our accommodation. Meet at Cafe near selected venue for briefing and a bite to eat if required, then travel to venue. Kit up and start walk into venue. Arrive at head of Canyon, Group Demonstrations and Briefing. Then Start decent of the Canyon. A quick bite to eat, at this point as we will still be enclosed in the Canyon. Exit and head for cars and get changed. We mainly canyon at Cautley Spout due to the challenge and exhilaration of descending England’s Highest Waterfall, however as this requires a moderate fitness level this may not be for you. Contact the team to discuss other venues available for your ability. 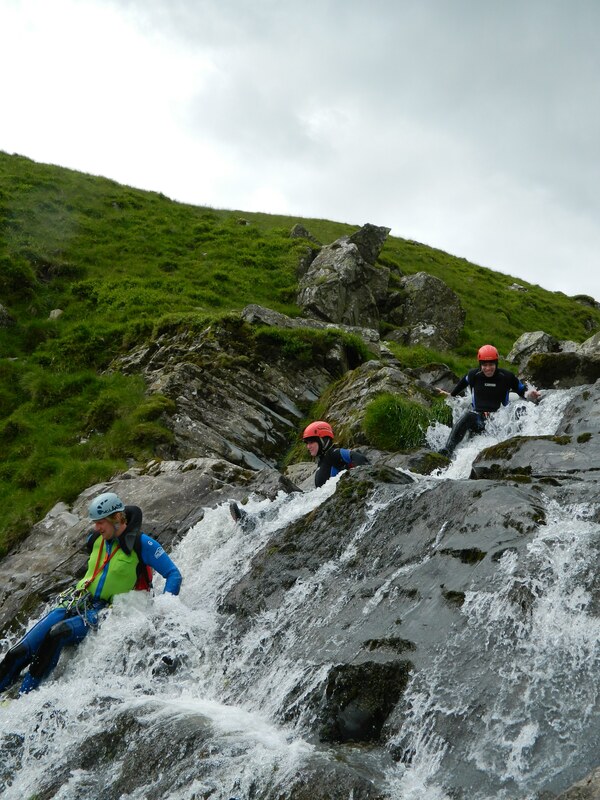 We recommend you participate in a gorge walking / ghyll scrambling session prior to canyoning. 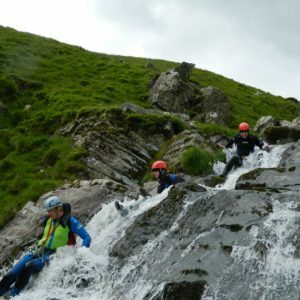 A full day of canyoning is available from £120 per person. We need a minimum of 2 people to run this trip. You will need a moderate fitness level to participate in this activity. As we consider canyoning as an intermediate level, prior experience in gorge walking and abseiling is necessary to enjoy and negotiate the waterfalls and rocks. This is a step up from our usual activities. You will be safely cared for by our professional experienced instructors who operate in many Canyons throughout the Yorkshire Dales and Lake District. Many outdoor providers offer canyoning but unfortunately mis-sell the customer gorge walking and therefore do not deliver the real experience. We are currently 1 of the 2 providers who offer Canyoning in Yorkshire and 1 of a very small handful in the UK that offers the real deal. All our Guides have received training from the UK Canyon Guide Association – we operate at the highest possible standard as your safety and enjoyment is our highest priority. For this activity, you need to be over 14 years old. You and your family must have completed the gorge walking and abseiling session at How Stean Gorge or had some prior experience of abseiling to conquer the largest waterfall in England. If in doubt please contact a member of our team on 01423 755666. We will confirm the venue following your booking. You will need swimwear to wear underneath the wet suit. For footwear, we recommend you bring along trainers and you will also need a towel for drying off afterwards. We will supply all your personal safety/protective equipment, wet suits, neoprene socks, gloves and hood.